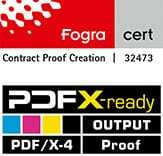 Electronics For Imaging, Inc., in short: EFI is an American company and one of the leading manufacturers of proofing software worldwide: EFI Colorproof XF, since 2013: Fiery XF. EFI is a solution provider for Large Format Printing systems, RIPs and color management solutions such as proofing. In the area of Proofing, a second major supplier is the company GMG from Tübingen, Germany, which primarily focusses on the part of color management.